A warm welcome is guaranteed at Wesley Methodist Church where worship and fellowship go hand in hand. Services have elements of the informal and formal, traditional and the modern but always with a strong commitment to spiritual growth. There is a regular bible study held at the church to which everyone is welcome. This is a great opportunity not just to learn more about the bible but to ask questions. Community is important to Wesley. 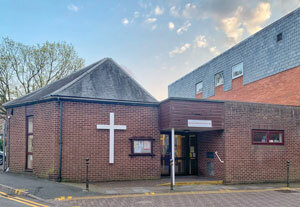 The church is situated in the centre of Carmarthen and is used throughout the week by local organisations such as the Rainbows, WI, Hard of Hearing Group, Weightwatchers and others. Rooms within the church building are available to hire at very competitive rates. There's a large meeting room and a small committee room, plus kitchen facilities, and we're a disabled accessible building. There's also wi-fi for user groups. If you are looking to have your child christened or have never been baptised yourself; are thinking about getting married or need the services of a minister because a loved one had died then please get in touch and we will be delighted to help you if we can. Wesley Methodist Church, Cambrian Place, Carmarthen SA31 1QG. The church is located in the town centre close to John Street Car Park, behind Boots the Chemist and at the rear of Marks & Spencers.